We’re excited to present our 4th episode of Geothoughts Conversations! This episode recounts a conversation held in June 2018 in the Montreal, QC home of Geothink Head Renee Sieber, a McGill University associate professor in the Department of Geography and School of Environment. It highlighted key research outcomes and influences over Geothink’s journey from beginning to end. We were joined by Sieber, then Project Manager Sonja Solomon (a doctoral candidate in McGill University’s School of Information Studies) and current Project Manager Drew Bush (a postdoctoral researcher in McGill University’s Department of Geography and School of Environment). You can find this episode below! You can also subscribe to our Podcasts by finding it on iTunes where it will also soon be available. Happy Holidays from everyone here at Geothink! This entry was posted in Geothink News, Geothoughts Podcasts and tagged Canada, Drew Bush, Geothoughts, Geothoughts conversations, open data, podcast, Renee Sieber, Sam Lumley, Sonja Solomun, Summer Institute on December 24, 2018 by Sam Lumley. Issue 14 of the Geothink Newsletter has been released! research and present reflections from our faculty and staff. We also catch up with Geothink Co-Applicant Leslie Shade, former Geothink student Edgar Baculi, and 2017 Geothink Summer Institute attendees Local Logic. If you have feedback or content for the newsletter, please contact the Editor, Sam Lumley. This entry was posted in Geothink News, Geothink Newsletter and tagged Claus Rinner, Drew Bush, Edgar Baculi, geothink&learn, journalism, Leslie Shade, local logic, Renee Sieber, Ryerson University School of Journalism, Sam Lumley, Sonja Solomun, urban and regional planning, urban planning, URISA, Victoria Fast on June 5, 2018 by Sam Lumley. 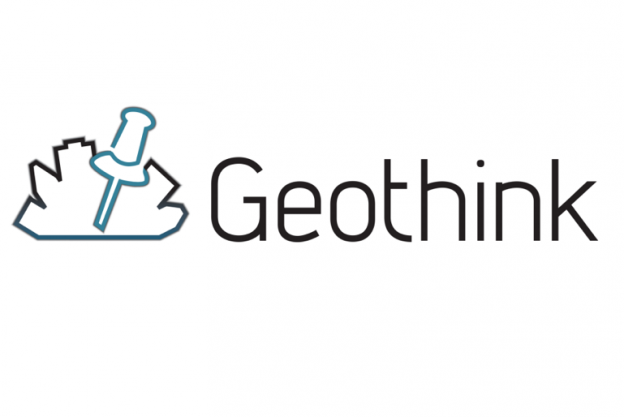 Issue 13 of the Geothink Newsletter has been released! In this issue, we celebrate the start of a new year by reflecting upon five successful Geothink&Learn webinars and highlighting exciting new Geothink research. at Employment and Social Development Canada; and other grant news. This entry was posted in Geothink News, Geothink Newsletter and tagged citizen science, citizen sensors, geothink&learn, Julia Conzon, Muki Haklay, open access, open data, Renee Sieber, Research Theme 5: Space Place Social Justice, social justice, Teresa Scassa on February 6, 2018 by Sam Lumley. This past February, we had the pleasure of viewing new research from Geothink academics and students at the Spatial Knowledge and Information (SKI) Canada conference in Banff, Alberta. This two-day conference is special as it addresses a variety of issues ranging from Geographic Information Systems (GIS) techniques and tool-building to applied spatial statistics, particularly in the context of Canadian social issues. Geothink Head, Dr. Renee Sieber, delivered the keynote address. She spoke on the “10 Things You Should Know About Engagement, Volunteerism, and Participation in Geospatial Technologies” and gave insights on how social theory and geospatial technologies coexist. She cautioned against treating technology as a black box and taking technical tools for granted, particularly if we do not completely understand them. Application of technology does not necessarily result in more or better participation. This is one of the potential issues of the drive towards data-driven decision making, particularly if we dispense with processes of democratic participation. This year, Geothink co-applicant Dr. Scott Bell (University of Saskatchewan) presented findings on Local patterns of national household survey non-response in Canadian cities. He highlighted methodological issues with government collection of census data, such as the Global Non-response Rate (GNR) variable. Some cities which are very small but with a high GNR can be excluded from the final results due to issues of spatial autocorrelation and edge effects. City growth is also problematic for normalising census data to make comparisons, particularly when different divisions grow at different rates. Dr. Bell’s research team developed a variety of models to predict non-response and found correlations of non-response rates with other social variables such as whether the respondent was a renter or aboriginal in origin. Geothink student Lauren Arnold (University of British Columbia Okanagan) spoke of The Potential Role of Open Data for Public Engagement in Environmental Assessment. Environmental assessments are highly dependent on spatial analysis and require datasets at very large spatial and temporal scales to calculate and predict cumulative effects of actions for the environment, society, and economy. Open data has the potential to address issues of public participation in environmental assessments and bring in more citizen involvement, improve transparency, and potentially even decision-making. Contextualising open data within Public Participation GIS (PPGIS), Arnold argued that open data can be another catalyst for integration of PPGIS into public consultation and decision-making processes. Suthee Sangiambut (McGill University) presented an alternative view of his Master’s research findings. Looking at open data flow in civic apps, he noted that data undergoes transformations within government, at the developer, and in between. Data transformations are often done outside of government by data re-users, but the choices government makes in how it collects or distributes data will affect data reuse down the line. He also demonstrated that open data consumed through apps are not an exact one-to-one representation of data used in government and users should be aware that open data still represents a curation of sorts. Shelley Cook (University of British Columbia Okanagan) won joint first prize for student presentations. She presented on The Temporal and Spatial Aspects of Homeless Social Capital and gave an in-depth look at how homeless is controlled by legislative and spatial tools, such as ‘red zones’, in Kelowna, BC. She found that the size of a homeless person’s geographic footprint (their coverage of the city) is related to their social capital; smaller activity spaces allow for less social capital. Homeless geographic footprint is also inversely related to dependency on services. However, once the homeless are provided housing, their geographic footprint shrinks. Finally, Brennan Field (University of Saskatchewan) presented on Policy Mobility of Police Interactions Open-Data. Such policies cover data collected on police interactions with the public such as vehicle stops and fines. His research will look at how these data policies are spread across jurisdictions and departments, and how they are translated to the operational level. This 5-9 April 2017, Geothinkers will be at the American Association of Geographers (AAG) annual meeting in Boston. For a list of presentations and panels to attend, see the programme guide here. We will be tweeting for the duration of the conference on Twitter (@geothinkca). This entry was posted in Conferences and tagged Brennan Field, Lauren Arnold, Renee Sieber, Scott Bell, Shelley Cook, SKICanada, Suthee Sangiambut on April 2, 2017 by Geothink. Media coverage in recent months may be focusing on Niantic’s continuous battle with Pokémon GO exploits and the game’s apparent demise, but here at Geothink we still see great potential in augmented reality (AR) games to promote community engagement. Our research examines communities and citizen-government engagement, particularly through geospatial technologies such as the geoweb. At the height of the craze, Pokémon GO resulted in conspicuous movements of people through engagement with a location-based service. This provides us with a convenient case study of the potential effects of a location-based service that causes movement of people through gamification. Geothink has also investigated gamification in urban planning and citizen engagement through platforms such as Minecraft and the precursor to Pokémon GO, Ingress. A recent publication from Geothink student, Lisa Mather Ward, and her supervisor, Dr. Pamela Robinson, has looked at Minecraft’s potential for public consultation. Geothink co-applicant Dr. Claus Rinner (Ryerson University, Department of Geography and Environmental Studies) has written a post introducing geographic analysis concepts with Pokémon GO. In it, he writes about geographic distribution, catchment areas, and links them to geospatial analysis methods such as buffering, distance decay, and suitability mapping. Some of the built-in distributions of Pokémon (such as having certain types of Pokémon available for certain types of terrain, weather, continents, and time of day) are similar to what we look for in ecological species distribution. The same concepts and techniques are widely used by corporations conducting market research, retail analysis, and location intelligence. As such, Pokémon Go is a great way to introduce basic geographic concepts to students and the interested public. A Medium for Contestation of Urban Places? Movements of people that are a direct result of their interaction with a mobile app could result in new contestations of space and place. Pokémon GO is potentially one tool that influences and reassigns cultural identity and platial meaning. 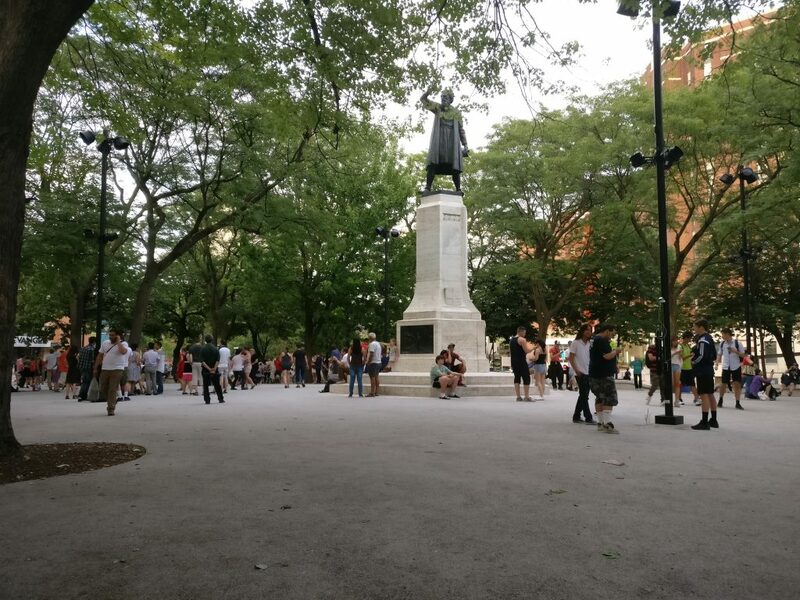 In downtown Montreal, we have seen a regular congregation of Pokémon trainers develop around Cabot Square to catch Pokémon, level up, and wrestle for control over its gym. Will this new influx of people change the identity of Cabot Square? Or has this already happened? Geothink Head, Dr. Renee Sieber (McGill University, Department of Geography and School of Environment), has spoken of the potential abuses or biases that may result from the placement of Pokémon and pokéstops on the map. Algorithms are the determinant for a pokéstop and Pokémon spawn locations. However, as Sieber emphasises, technology itself should never be assumed to be neutral. Implicit biases may be injected by programmers, managers of the technology, and the underlying data. For example, it has been noted that certain neighbourhoods are poorer in pokéstops, potentially due to the distribution biases in crowdsourced contributions that formed a part of the underlying pokéstop dataset. On the other hand, does location-based gaming have the potential for real-world community building? Are players actually exploring their own communities? Geothink co-applicant Dr. Stéphane Roche (Université Laval, Département des sciences géomatiques) and his PhD student, Territutea Quesnot have studied landmarks and wayfinding, particularly through social networks with gamified interactions such as FourSquare. As Roche notes, the concept of ‘checking in’ to a location is not new. Pokémon GO’s uniqueness is in its content and in overlaying the Pokémon universe over the real world (such as through the camera feature) with more integration than Ingress. For Roche, such movements of people could also be a form of contestation or appropriation of places. He defines an urban place as “an equation between a physical location, an event, and the name associated with the phenomenon”. Landmarks in the city can therefore have multiple ‘places’ depending on their usage. For example, a pond has one use during the summer, but turns into an ice skating rink during the winter. Pokémon GO, Roche says, “has created new urban places, in a location where existing places were already there”. Roche cautions us to not immediately condemn the phenomenon of Pokémon GO players congregating in large groups, as contestation and appropriation of urban places is not a new process. Pokémon GO itself has not had an entirely negative effect on urban environments and has been attributed as a factor in revitalising the Brussels community after this year’s terrorist attacks. Roche is optimistic that “gamification and technology has the potential to improve our understanding of the world, improve our skills, including spatial skills, and could help people to discover new components of the world”, but also echoes Sieber’s concerns over algorithmic regulation where, “because of the choices that are embedded in the code and algorithms, there is a kind of orientation and social classification…and it becomes more and more difficult to discover new things”. According to the students, AR has a high potential due to its fusing of the digital and physical. Unlike Virtual Reality (VR), AR does not completely remove the physical world and users can still interact with each other face-to-face, rather than being restricted to a virtual environment. Currently at a preliminary stage of their project, the students have investigated the distribution of pokéstops and urban accessibility to pokéstops to examine the geographic reach of the game in the city. The density and location of check-in locations for any gamified service are crucial when attempting to attract people to a particular location, such as the location of a public consultation or town hall meeting and also important for evaluating how inclusive the tool can be in terms of reaching residents. The students discovered that a player’s experiences of Pokémon GO can really differ depending on where they live in Toronto. Team PokéPlan (as they have named themselves) is also looking at other issues that a municipality will be concerned with, such as legal considerations (privacy, liability), language barriers, issues of service coverage and accessibility (the digital divide), and how to reach broad and target audiences, and finally gamification. 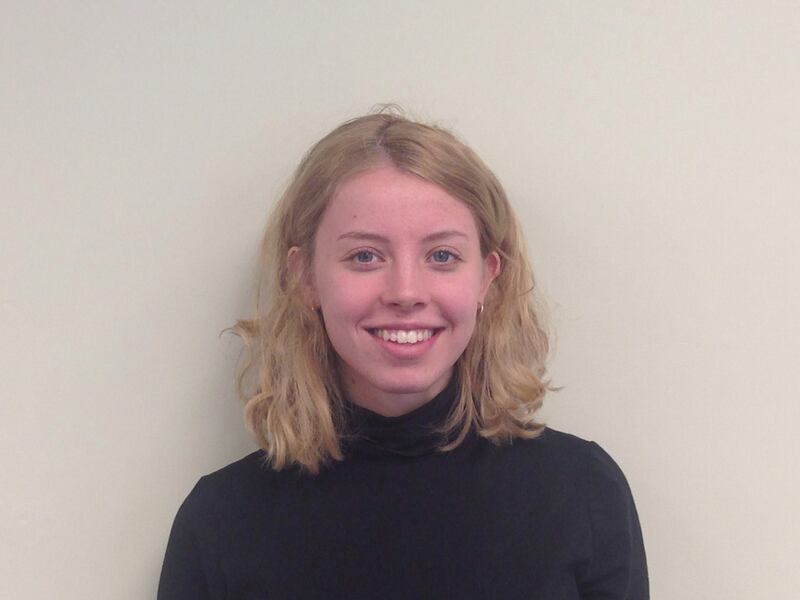 According to Geothink student Corinna Prior, the City of Toronto has already begun to experiment with more flexible types of consultation such as the Planners in Public Spaces programme where planners go to the people. For Prior, “gamification is a really powerful tool. The potential to get people out and about is really powerful”. If AR and gamification could be used to support public consultation processes, we may experience radical changes in how citizens interact with their municipal governments. More updates on TeamPokéPlan once their project ramps up. 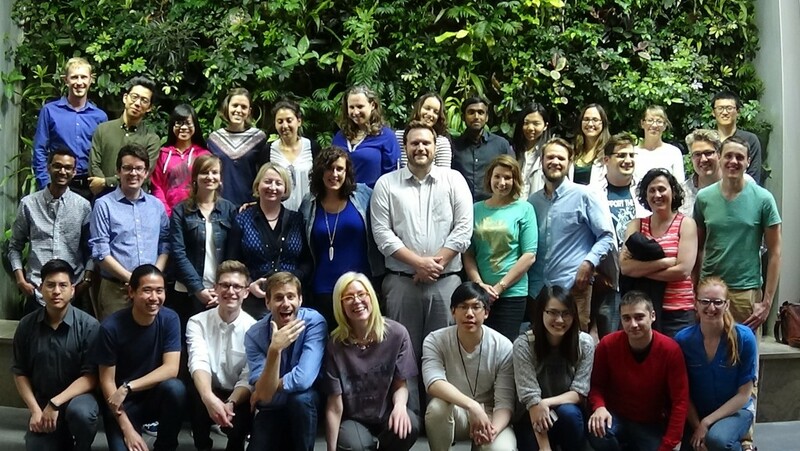 In November, Team PokéPlan will host a World Town Planning Day breakfast (November 8th), be the guest speakers at Civic Tech Toronto’s Hack Night (November 15th) and present their final report on November 22nd. For more information about their work please contact Pamela Robinson. This entry was posted in In The News and tagged augmented reality, Claus Rinner, Corinna Prior, gamification, Pamela Robinson, Pokemon Go, Renee Sieber, Stephane Roche on October 28, 2016 by Geothink. 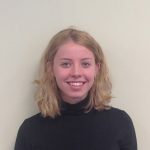 This is a guest post from Geothink student Qing Lu (Lucy), University of Waterloo, under Professor Peter Johnson. She writes about her recent experience in a Geothink student exchange. 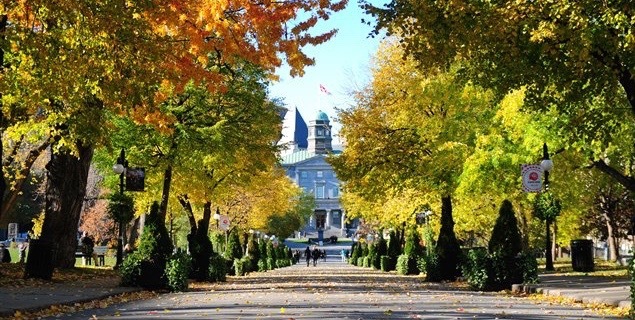 In the middle of August, I had the opportunity to visit McGill University via the Geothink Summer Exchange Programme. Approaching the completion of my graduation thesis, I thought Dr. Renee Sieber and her team could help me identify the gaps of my research and add new insights. Dr. Sieber is the Principal Investigator of Geothink and her research on public participation and the geoweb, which is related to my research on municipal government mobile applications for 311 service requests. My research aims to determine the characteristics of communication channel use and identify advantages and challenges of the mobile app channel. Since my research is a new area that does not have an abundance of prior studies for reference, insights and opinions from experts and peers are important. I hoped to hear their perspectives on the potentials and issues of 311 apps for municipalities, more specifically, the impacts of 311 apps on efficiency of governments as well as on citizen engagement. Luckily, I got to meet our Geothink Student Coordinator, Peck Sangiambut, who has also looked at citizen engagement via civic apps (including a 311 service request app), under Dr. Sieber. On the first day, I did a presentation for Dr. Sieber and her team. I presented my research on 311 apps and results of analysis of 311 requests in the City of Edmonton. A paper about this is published in the Urban Planning journal. In addition, I presented results of interviews with six municipalities about their perspectives on 311 app usage. 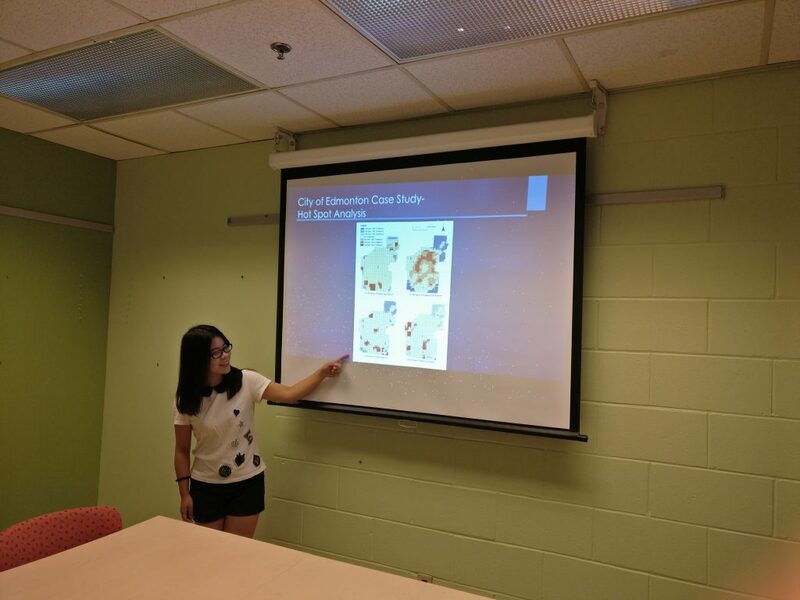 Instead of a regular presentation that starts with presentation and wraps up with questions, it was a lively discussion that everyone exchanged opinions and ideas in the process of presentation, and we ended up an hour over our originally scheduled time! Dr. Sieber and her team were very outspoken and many of their points worth pondering. One of the things that I ignored in my research is the geographic offsets of 311 data obtained in open data catalogue. To protect the privacy of reporters, the locations of reported incidents are likely to be shifted from their actual geographic locations, for example, a tree pruning request points to the centre of a building. Therefore, the results of my spatial analysis of 311 data contain bias caused by inaccurate locations. In addition, efficiency could conflict with engagement when we know newly-introduced channels such as mobile apps are more efficient than telephone calls. Some people, especially the elderly, would be left behind if municipalities simply seek to maximise operational efficiency and perhaps reduce staffing for traditional channels of communication (such as telephone hotlines). For the second day, Dr. Sieber’s team and I went to a panel discussion called GIS Without GIS: Spatial Technologies for Social Change. This was part of the World Social Forum and included discussion of the roles open data, mapping, and open source tools in producing social change. The invited speakers shared their opinions and experiences working with open data. This discussion inspired me to look at the open data aspect of my research as some municipalities publish the 311 data on the open data catalogue while others do not. It would be interesting to investigate if the openness of 311 reports impact citizens’ engagement. This trip has provided me with the opportunity to communicate my research findings with people who work in the same field. I also got a deeper understanding of research – research is not only finding answers to questions but also seeking questions to be answered. In my research, I have found that there is a trend that mobile app use for citizens to contact governments is increasing and telephone calls are decreasing, and responses from municipalities show that mobile apps are more efficient and cost-saving. However, the question remains that if the governments should give up traditional communication channels and turn to newly-introduced ones. As the communication channels involve both citizens and governments, citizens’ perspectives on the multiple channels should also be considered when evaluating the channels. I am deeply interested in these questions, and I will investigate them in my future research. My sincere thanks to Geothink for giving the opportunity to go on a summer exchange at the University of Waterloo. Thank you to Dr. Renee Sieber for hosting me and sharing your valuable comments and opinions. Thank you to Sonja and Peck for organizing everything well. To the Geothink community members: please don’t hesitate to contact me if you have further questions or if you are considering going on a summer exchange yourself. Lucy (Qing) Lu is a Master’s student under the supervision of Dr. Peter Johnson in the Department of Geography and Environmental Management at University of Waterloo. Her research focuses on municipal government mobile applications, 311 services and e-government. Lucy can be reached by email at q25lu@uwaterloo.ca. This entry was posted in In The News and tagged geothink students, Qing Lu, Renee Sieber, student exchange on September 1, 2016 by Geothink.